The best acoustic guitar provides equal parts good sound, aesthetics, affordability and optimal feel. It should not cause problems when it comes to tensioning the strings. If you are a novice guitarist, do not worry about spending a lot of money to buy your first acoustic guitar. You can find high-quality acoustic guitars under $1000 that match your specific needs. If you intend playing with a band or perform in concerts, consider purchasing an electrified acoustic guitar. The electrified acoustic guitars are equipped with pickups and pre-amplifiers that allow connection to an amplifier or audio system. The electrified acoustic guitars can be used at home without the need to connect to an amplifier. If you do not need to play at high volumes, you can easily opt for a non-electrified acoustic guitar. This guitar is perfect for learning how to play. It is sturdy and has an impressive harmony of sound due to the high-quality wood. These characteristics are unsurprising from a Yamaha brand instrument. Despite being an affordable product, the neck of this guitar is praised by many people who use the instrument. However, buying low-cost units often come with necks that can be rough, which means the fingers do not slip well. This is not the case with the Yamaha-F310. Price: $300. This model delivers awesome sound without breaking the bank. It is a hand-crafted acoustic instrument that is both robust and manageable. It is perfect for those who want to learn how to play. The unit is available for under $100. The EVO series is synonymous with impressive sound and affordability. This retro-looking guitar is a replica of the Gipsy guitars, which are historically linked to the extraordinary guitarist Django Reinhardt who brought Gipsy Jazz into the mainstream. This unit has a particular sound because of the shape of the hole. The quality of construction is good. Price: $674.32. This is another gem among the best-selling affordable acoustic guitars. The CD-60 CE is all about practicality thanks to the pre-amplifier and the included tuner. The acoustic guitar is easily portable and offers unquestionable playability. The warm and loud sound makes it a must-have for all those who want an impressive guitar. Price: $299.99. Classifying the best acoustic guitars is not an easy task. The final choice is subjective because it depends strictly on personal style and aesthetic taste that allows an individual to opt for a given design. Beginners will find an acoustic guitar with nylon strings a superb option because it is less intense on the fingers and could encourage longer play sessions. The nylon strings offer a soft sound suitable for classical or flamenco music. If you want to play rock, country, blues or folk music, take a look at the guitars with steel strings that offer a crisp and bright sound. Acoustic guitars generally come with steel strings but you can replace them with nylon strings. You can also replace strings on a classical guitar that normally has nylon strings. These can be replaced with steel strings. While there are many poor quality guitars on the market, every model reviewed above is noteworthy. There are many other interesting models, you can choose the guitar that best suits your needs based on price, experience and the musical genre. The standard acoustic guitar is a folk instrument similar to a classical guitar. On the other hand, the dreadnought acoustic unit is a folk guitar with a large soundbox and produces considerable volume. The Jumbo variant comes with a large case, which is slightly narrower at the top. Due to the generous shape of the design, the sound is impressive. The shape of the guitar contributes to the output and its signature sound. The 8-shape and the difference in width of the case between the top and the bottom give greater density to the bass. It also helps make the treble stand out. You should keep this aspect in mind when choosing an acoustic guitar. Like all guitars, the standard acoustic version comes with six strings but the 12-string model is also very popular. The structure of the 12-string guitar is the same as the 6-string guitar with the only difference being the number of mechanics on the headstock. The same applies to the number of pins on the bridge. In terms of tuning, the strings are coupled. The traditional tuning of the 6 strings (Mi – Si – Sol – Re – La – Mi) is accompanied by a coupling string. In the 4th, 5th and 6th, the second string is tuned one octave above and is not coated. The 12-string guitar lends itself well to the accompanying parts because it has a full and harmonious sound. The neck of the guitar is joined to the body of the guitar and ends at the headstock. The fingerboard is mounted above the neck while the back is shaped in a way that accommodates the guitarist’s hand. Most acoustic guitars use a neck glued onto the body of the guitar. The alternative is a bolt-on handle, which is most commonly used on electric guitars. The fingerboard is a sheet of wood glued to the neck. The fingerboards are typically made of rosewood or ebony. In addition, they have inlays or symbols on the odd keys, starting from the third – excluding the 11th and 13th in favor of the 12th or the 8th. The scoop is located on the end of the neck in front of the body of the guitar and has tuners also called pegs that allow you to tune the guitar. The body of an acoustic guitar is supported by internal reinforcements; the sides and the back together form a hollow chamber. The size and shape of the body affect both the sound and the playability of the instrument. Experts recommend choosing the acoustic guitar based on how comfortable it feels when playing. For a louder sound without external amplification, the acoustic guitar is the one you need. It allows you to produce classical and folk music compared to an electric guitar. Choosing a good quality instrument is essential. If you buy a low-end model, you risk working with an instrument that is difficult to tune and produces false tones. In addition, a poorly tuned guitar may compromise the learning process because you will be accustomed to these false notes. Some poorly designed models do not allow easier finger action. To make the best choice, compare a wide variety of instruments available on the market. Different types of woods have a distinct sound signature, which influences the identity of the instrument. This type of wood is used in the manufacture of acoustic guitars and electric guitars. It builds the back and sides of most folk units. Mahogany is known for producing a particularly warm sound. Its bass and mediums are full while the highs are velvety. Originally used to make classical guitars, Cedar has gained considerable popularity over the last thirty years. This type of material is used to make fingerboards for steel string guitars. It is less dense and more supple than spruce. Cedar is a soft wood that produces an impressive, velvety sound. The overtones are equally distributed on the spectrum rather than concentrated on the bass and treble. This type of wood is also aesthetically attractive. Cherry lies at the crossroads between mahogany and maple. It is known for emphasizing on mediums. The cherry tree is an excellent choice for the back and sides of midrange guitars. It is particularly used by a number of manufacturers that are renowned for the remarkable quality-price ratio of their productions. This unusual species is mainly reserved for flamenco guitars. Ebony is an extremely dense, high-end wood that is often used to build the neck. It has a natural compression and shine that brings precision to the sound. Spruce is used in the production of acoustic guitars (also used in the development of violins or mandolins). Its rigidity-weight ratio induces an optimal velocity of sound that makes it ideal for the manufacture of guitars. Sitka Spruce helps improve overtone ratio. The overtones bring a distinct character to the instrument, powerful sound and help maintain clarity when the guitar is played with intensity. This type of wood is used for making necks. In the acoustic context, it is most often used to build back and sides. It is a rigid and fairly dense wood that conducts vibrations well with a crystalline character. It produces impressive high-mediums and the material is suitable for playing in groups. It makes electric acoustic models less sensitive to feedback. It is also appreciated for its beautiful appearance. Rosewood is a must in the design of the most upscale acoustic guitars. The material is denser than Mahogany (a type of wood that is common in the manufacture of acoustics). It produces a wide range of overtones (over-frequencies more acute than the fundamental frequency that enriches it). In addition, the material helps produce solid and complex bass frequencies and a stroke. The average price range for an acoustic guitar varies depending on a number of factors. The quality of the guitar plays a key role in determining the retail price. Interestingly, the market is filled with quality acoustic guitars under $1000. 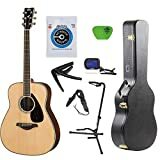 This allows both novices and experienced guitarists to find a suitable instrument without breaking the bank.